As one of the simplest and cheapest streaming devices available, the Google Chromecast is a great choice for the everyday streamer. With tons of dedicated games and unique features, it’s also one of the most comprehensive platforms around. Unlike other media streamers like, say, Apple TV and Roku, Chromecast is a breeze to install - and, one of the easiest to use, too. 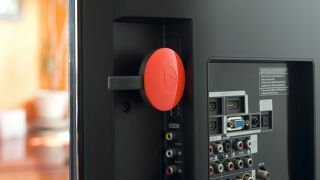 Not sure where to start with Chromecast? Here’s how to use Chromecast, and how you can set up Google's streamer to work with your TV, PC and mobile devices. First, unpack your Chromecast and plug it into your TV using one of the HDMI ports. Then plug your USB cord into a nearby outlet using the Chromecast adapter. You can also plug the USB cable into the back of your TV if you have an open port. Once everything’s been plugged in, the small LED on your Chromecast should automatically light up. Next, turn your TV on and change the settings to match the corresponding HDMI source. You should be greeted with Google’s ‘Set me up’ screen. Now, depending on the device you’re using, you may need to download the Google Home app from either the Google Play Store or Apple Store. Note that most Android users should already have Google Home preinstalled. Alternatively, Chrome PC and Mac users should be able to bypass this installation process altogether. After you’ve downloaded Google Home on your streaming device, open the app and click (or tap) on the Devices icon in the top right-hand corner. The app will then ask to access your location. Click OK and proceed to the next screen. Once your Chromecast has been located, the Google Home app will begin setting it up automatically. When this is done, click Continue. You’ll now be moved to a new page asking to name your Chromecast network. Here you should see a unique key code on both your TV and the device you’re using to set up Chromecast. Make sure both numbers match. If they do (and they definitely should), tap I See the Code. From there, Chromecast will search for your Wi-Fi network. Once it’s connected, you should be good to go. Easy enough, right? There are two main ways to cast to your Chromecast: through your smartphone and via your computer. While both are fairly easy to do, the smartphone route is the more popular option as this makes it possible to use the Chromecast as a connector to help bring your small screen to the big screen. That said, this guide will cover both ways. In order to cast to Chromecast from your smartphone, you’re going to need a casting app. While there are tons of free options, we’ve found that LocalCast For Chromecast offers the best streaming speeds without sacrificing audio or picture quality. You can download it from either Google Play or the Apple Store. Once you’ve downloaded and installed LocalCast, launch the app and tap the Cast icon on the lower-right corner and choose your casting device. Now, use your phone to find whatever you want to cast to Chromecast (movies, pics, songs, etc) and voila. Note that the setup process is roughly the same for both iOS and Android users. However, the Cast icon may be located somewhere different on Apple devices. While casting on a smartphone requires a third-party app, casting from your desktop or laptop device requires no such prerequisites – given that you have Google Chrome installed, that is. To cast from your Mac or PC, simply open your Chrome browser and click on the menu icon at the top right-hand corner. Scroll down and click Cast. You may receive a one-time pop-up asking to enable Google Hangouts and other cloud-based services. Decide whether you want to allow this (there are really no downsides either way), and click OK, Got It. Now choose where you want to cast. If installed correctly, you should see your Chromecast device in the options provided. From there, simply click on your new Chromecast icon and you should be good to go. The great thing about Chromecast is how fluid the interface is: You can cast Netflix, Hulu, Spotify, and other great services instantly. That said, Amazon Prime is a little trickier to set up, as you’ll need to go directly through your Mac or PC’s Chrome browser in order to stream. Another notable feature of Chromecast is the ability to turn your smartphone into a mobile game controller. Google has released a slew of dedicated Chromecast games that essentially turn your phone into a portable gamepad. Click here for an updated list. To cast from Android or iOS devices, simply use the built-in casting feature by scrolling to your Quick Settings menu and tapping on the Cast icon. Most Android phones and tablets come with this feature already installed, but if you don’t see it on your device, you can set it up by heading to Settings and adding the Cast icon to your options menu. Now that you know how Chromecast works, you can start playing around with its various features. Although one thing you might notice is how some apps and services may be blocked in your region. Fortunately, you can expand your streaming possibilities while simultaneously securing your connection by using a VPN (or Virtual Private Network). A VPN lets you bypass geographical restrictions and stream content from anywhere in the world, all while offering a secure layer of protection by encrypting your connection and anonymizing your location. While Chromecast devices don’t (yet) offer built-in VPN functionality, you can install a VPN on your router and instantly cover every device in your home. While there are tons of good (and cheap) VPNs available, we recommend going with ExpressVPN. As our highest rated VPN, it offers the best all-round service for the money. More than that, this VPN service provides dedicated router apps so that you won’t have to waste time (or money) trying to set one up on your own.